What gets the most attention at general museums? After dinosaurs (q.v.) of course. No, we don�t need an internet "vote" to determine the answer. It is, hands down, the musty exhibit devoted to ancient Egypt. All those sarcophagi! (Mummies to you, buster.) It is like being in a big funeral parlour, only you get to see what goes on in the embalming room and you are not busted up with grief about the deceased. Don�t you wish we had colourful coffins now like they had in old Egypt? You�d go to more funerals, right? And if they had open casket showing bodies wrapped in bandages we�d all go to the wakes just so that we could shout: "I want my mummy!" Then there are the pyramids. The neatest and most mysterious (read, pointless) buildings ever made. We like to wonder how people ever made them without the aid of space aliens (q.v.). Well, many of us believe they were made by space aliens. This theory provides a plausible answer to the age-old question about enigmatic Egypt: where did they get that awesome heavy makeup? Answer: "Ding dong, aliens calling." Speaking of makeup (q.v. ), what about hieroglyphics? The Egyptians, to give them their due, had a great visual style. Their face paint, their sarcophagi, their weird edifices, and their writing. So full of pictures--it is an illiterate�s dream of what writing should be like: a great stream of little pictures, the earliest form of comic book. Reflect a moment, however. What are we looking at in our sarcophagus-laden museums? The glory that was Egypt? No. We see a dug-up cemetery. A bunch of dried-up bodies, a few cheap knick-knacks buried with the bodies, evidence of countless ages of previous grave robbery (they got the really good stuff), and some pictures of monumentally tasteless tombstones. This begs the question of what Egypt�s importance was. What was its contribution to civilization? All of those neat museum pieces, if you think about it, merely demonstrate that Egypt was a colossal dead end. Underline dead. Coffins, mummification, pyramids, temples, etc. etc. All stuff for the dead. What did Egypt have to offer for the living? Little do we know about that, for they were not much concerned to pass it on. Although Egypt has left us some extremely old garbage, civilization was not born there. The true cradle of civilization was Mesopotamia. (The Indus Valley and China have very good claims as well and may be independent foundations.) Egypt was a mere exotic sideshow to the glories that emerged out of the land of the Tigris and the Euphrates Rivers: first Sumer, then Akkad, Assyria, and Babylon. Through the Phoenicians this culture was transmitted to Greece, which in turn led to Rome and beyond. Those of us of European and Middle Eastern descent are all children of Mesopotamia. Ancient Egypt led only to the films of Cecil B. de Mille (q.v.). Egypt can be dubbed a "civilization" only in an extended sense. Civilization literally means living in cities--or at least, by our standards, communities larger than villages. But this is what the Egyptians didn�t do. They lived in little villages stretched along the Nile River (q.v., finding the source of). There was no need in Egypt to develop community organization to maintain irrigation like they had in Mesopotamia because the Nile flooded every year and did all the watering and fertilization for them. In a sense this was the Garden of Eden (q.v. ), since they didn�t have to work (that hard) for a living. In their spare time these guys built fancy cities for the dead, but didn�t do a whole lot to advance the art of living. The Egyptians had pharoahs (sacred kings) and these rulers had dynasties. They are celebrated for marrying their sisters. 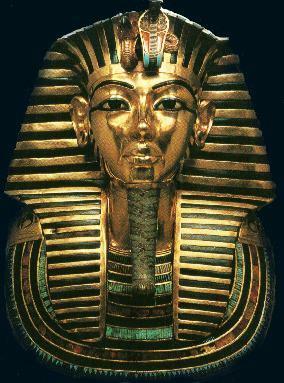 Oddly enough, the most famous pharaoh of all, King Tut (q.v. ), is also one of the most short-lived and least important in anybody�s history. What he is known for is being dead. (Natch!) There were occasional royal gals--e.g. Nefertiti (q.v.). But the biggest bust of all is the ineffectual semi-Greek poser, Cleopatra (q.v.). If you think I unjustly rate her too low, consider the company she has kept over the years: Julius Caesar (q.v. ), Mark Antony (q.v. ), Cecil B. de Mille, Elizabeth Taylor (q.v. ), and Richard Burton (q.v.)! We have long lists of these pharaohs. In place of history in Egypt what we have is genealogy--and an inbred one at that! When we hear about the pharoahs� royal doings it is almost always to find out that they were making their own people and/or their neighbours miserable. For example, the pyramids were no make-work, get-us-out-of-the-Depression, WPA project. They were built at the cost of considerable human suffering. And benefitted no one, except to flatter the vanity of the big P. The universal rallying cry of Jews and just about everybody else: "Tell old Pharoah, let my people go!" I believe that we ought to remember and celebrate the Battle of Kadesh, one of the turning points of history. It seems that one of the Pharoahs, Rameses was his name, set out to conquer the Middle East (or everywhere, as it was known then), marched through Palestine (q.v. ), and confronted the Hittites on the edge of Syria. There was a really big scuffle, by the standards of that time, and Rameses declared a splendid victory. But then he marched back and didn�t bother the Hittites any more. The warriors from Asia Minor (Turkey, buster) didn�t care if Rameses got the "victory." The point is that he left and didn�t come back. Between the lines of the hieroglyphics we can plainly read that the forces of the cities of life had whupped the posterior of the king of the cities of death. Hieroglyphics, by the way, superficially glitzy though they may be, were an early form of writing that led nowhere. Wondering about hieroglyphics, it must be granted, gave Napoleon�s (q.v.) scholarly French soldiers something to do after they were marooned in Egypt after Admiral Nelson destroyed their ships in the Battle of the Nile. However that may be, our letters derive from symbols, not pictures, and these letters were given their earliest development in Mesopotamia. And what literature has been left us by ancient Egypt? The Book of the Dead. Enough said. Necrophiliacs drink it up. Sensible people want to know not how to be dead, but how to live in the face of death. That is why the Book of the Dead is read only by loonies. Meanwhile, Mesopotamia has given us a larger literature, including the life-affirming Epic of Gilgamesh. To this day there has not been written a work equal to Gilgamesh in setting forth a realistic and hopeful view of human existence. All of our subsequent philosophy and literature is just commentary. To recapitulate: Tell those museum curators to clear out those irrelevant caskets and body bags. To paraphrase an ancient English song, "Sumer is a-cummin in."